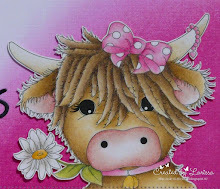 Goodmorning, I am Larissa from Car-d-eliciousand today I am posting a card that I made for the monthly challenge from Gerda Steiner designs. 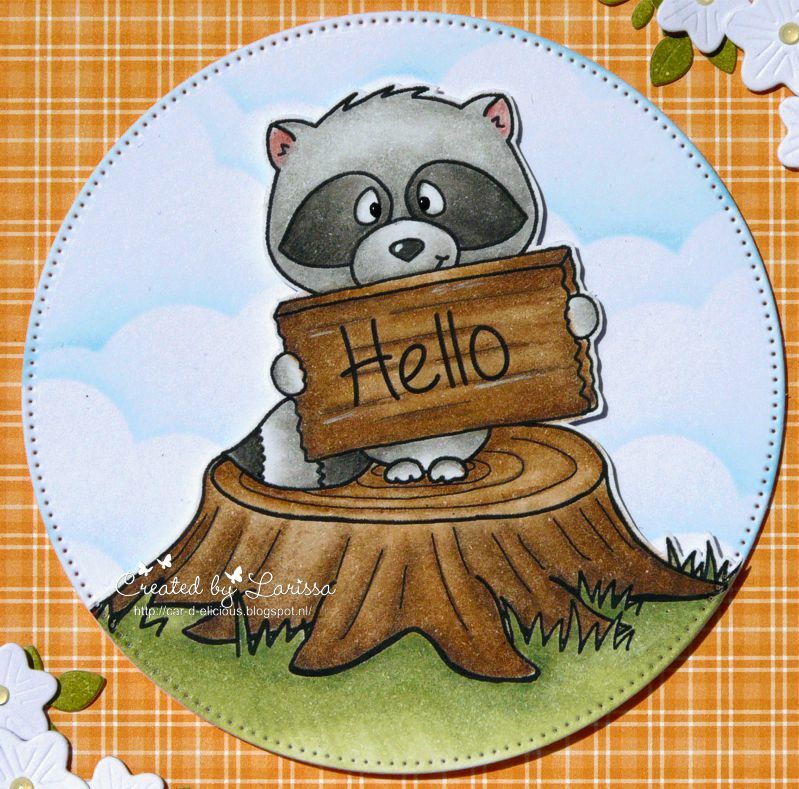 If you buy the October image: Racoon from Gerda Steiner designs and make a card with it this month, you automatically get next months image for free. Really fabulous! 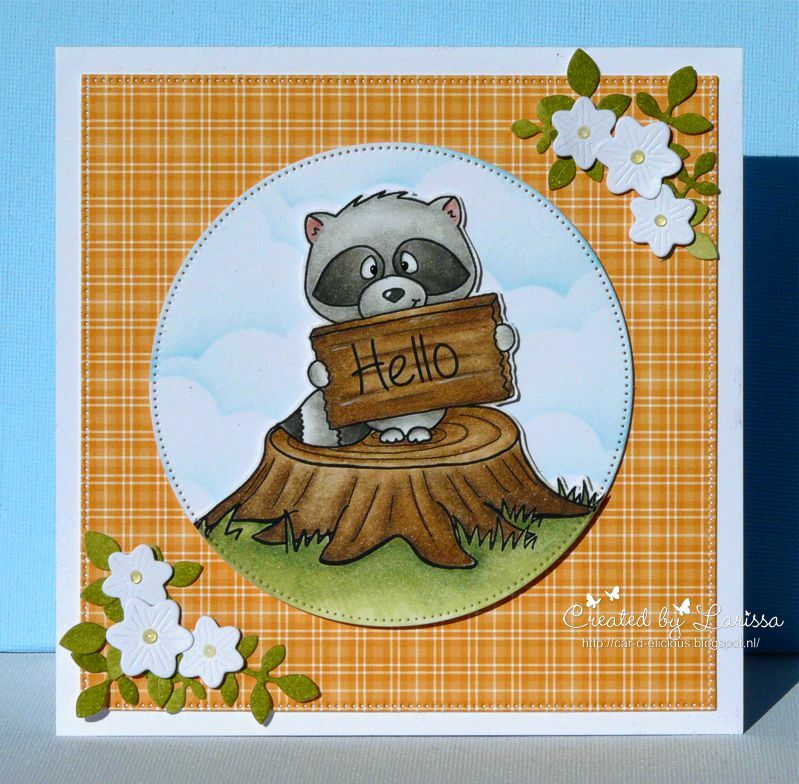 This month the image is Racoon from Gerda Steiner designs. I typed my own sentiment on the sign and then I printed the image. I have coloured the image with my Polychromos pencils, the black glaze pen and a white gelpen. 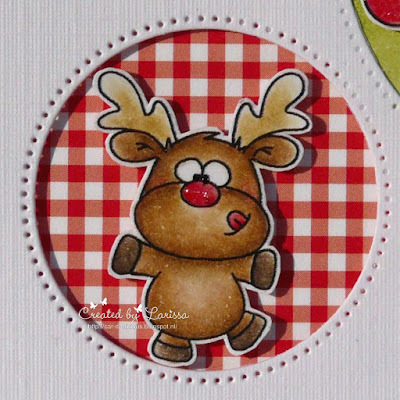 I have die-cut the image with the Crea-nest-lies XXL 49 from Crealies and then I fussy cut the upper part of the image. 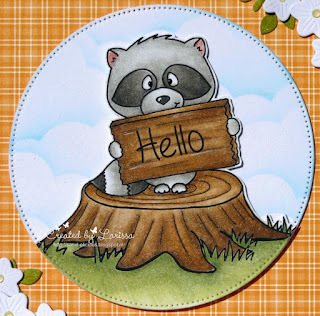 I diec-ut another circle from white cardstock with the same dies. On top of that circle I made a cloudy background with the Mini cloud edges stencil from My favorite things and Tumbled glass distress ink. From orange plaid paper from the Perfectly plaid fall paper pack from Lawn fawn I die-cut a square with the Crea-nest-lies XXL 42 from Crealies and I adhered it on a white card. 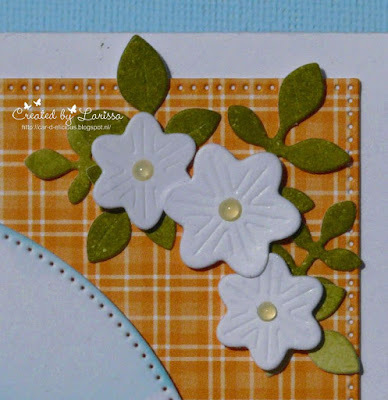 I decorated 2 corners of the card with some flowers and leaves. 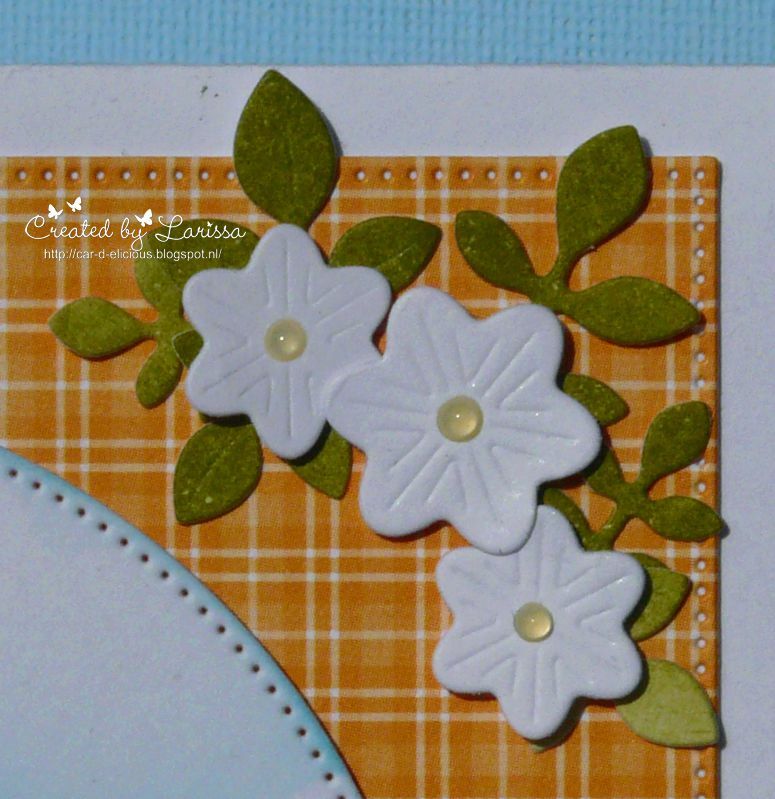 I die-cut the flowers from white cardstock with the Layered floral set Die-047j from Impression obsession. I decorated the middle of the flowers with Limoncello jewel drops from Nuvo. 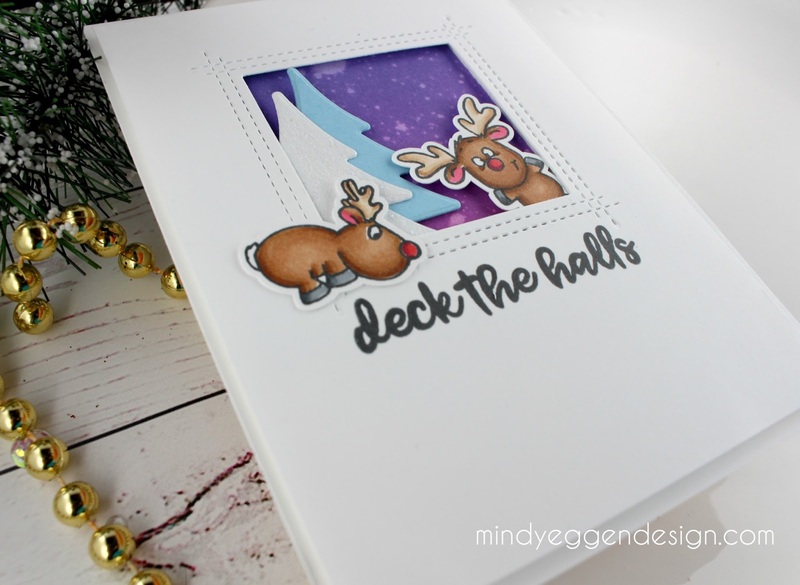 The leaves are cut with the Leaf cluster die-066-c from Impression obsession and the Lit-267 from Kreaxions from white cardstock and then I colloured them with Peeled paint distress ink. 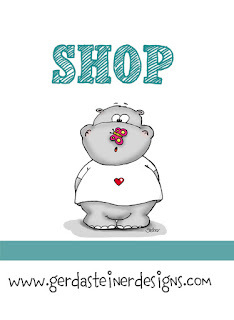 Goodmorning, I am Larissa from Car-d-elicious and today I amposting 2 tags. 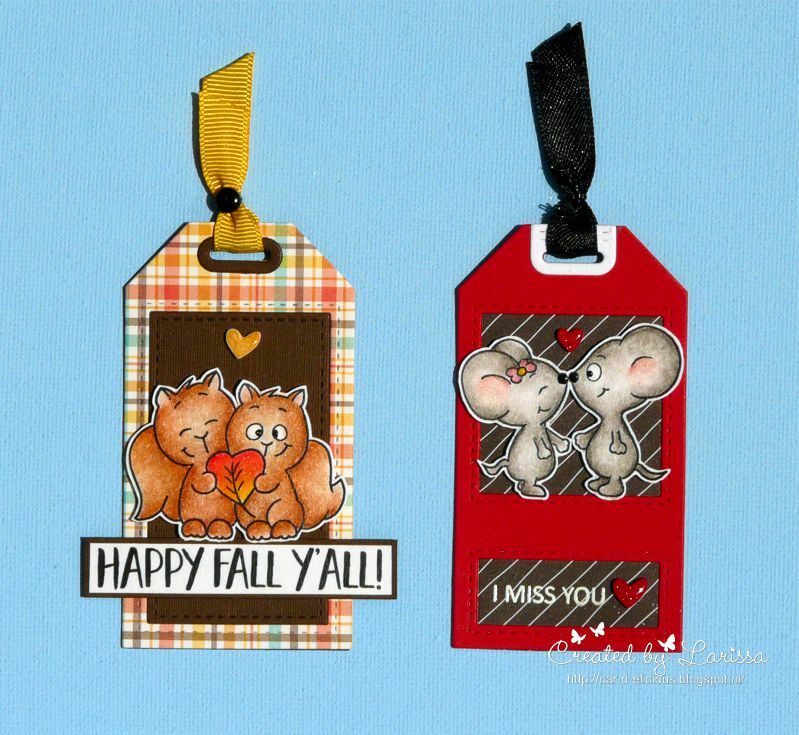 I used the stampset Fall in love from Gerda Steiner designs to make 2 little tags. 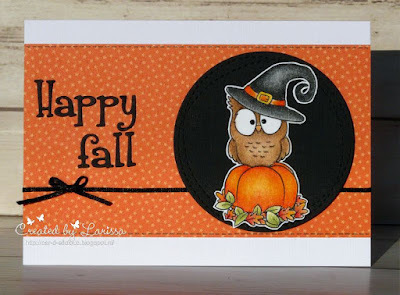 This is a real autumn stampset , but I am showing you that you can use it for another occasion. You could use it to let someone know that you miss them if you use other colours and paper. 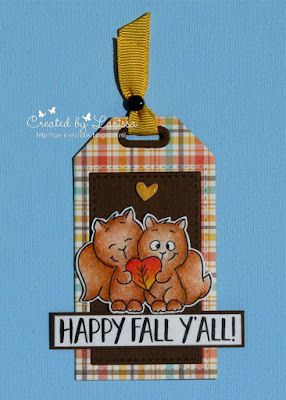 The first tag is a real autumn tag. 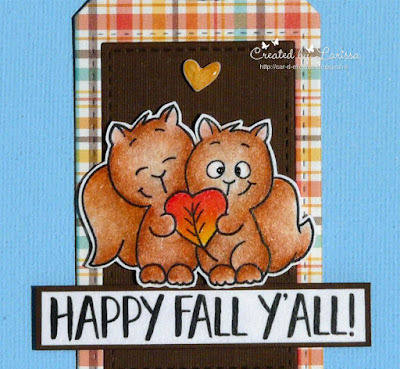 I used the cute squirrel image from the set Fall in love from Gerda Steiner designs on it. I have coloured the image with my Polychromos pencils and the black glaze pen and then I fussy cut the image. The tag is is made with the Tag builder blueprints 5 from My favorite things. 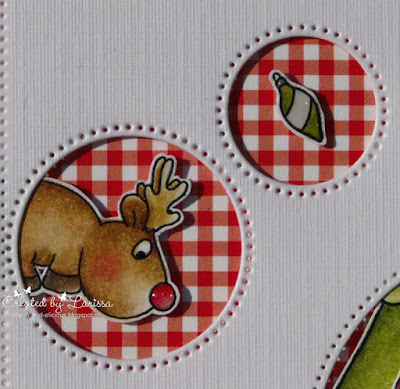 I used dark brown cardstock and plaid paper from the Perfectly plaid paperpad from Lawn fawn. 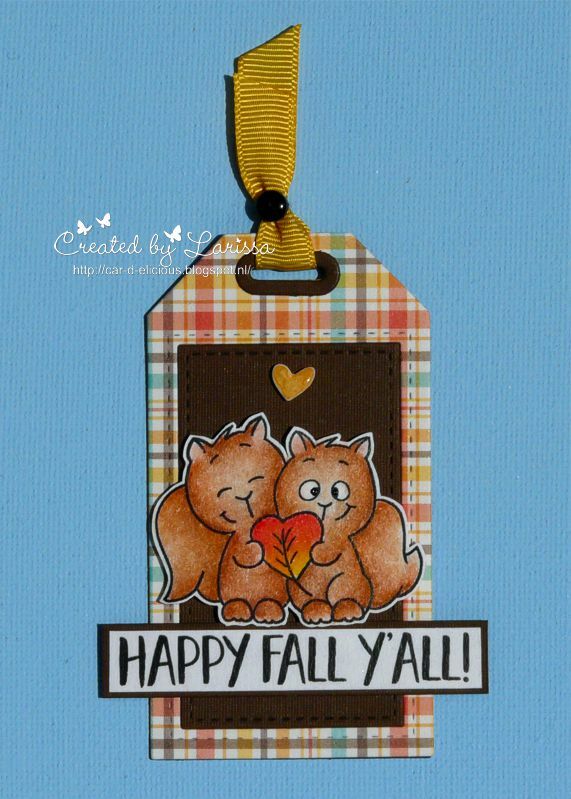 I stamped the sentiment on a piece of brown cardstock and I adhered it on the tag. I die-cut a tiny heart from yellow cardstock and adhered it with foamtape above the image. I applied Limoncello jewel drops from Nuvo on the heart. I tied a yellow ribbon through the tag and tied it together with black thread and a tiny black button. 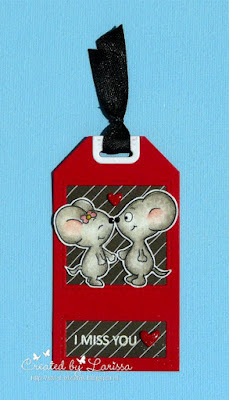 On the second tag I used the cute mice from the stampset Fall in love from Gerda Steiner designs. I coloured them again with my pencils. 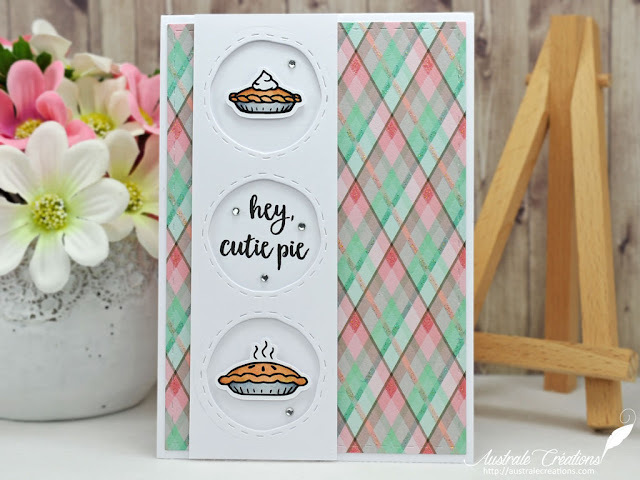 I used a different tag from the set Tag builder blueprints 5 from My favorite things. This time I used red cardstock and black striped design paper from the Trick or treat paperpad from My mind's eye. On the lower design paper I stamped a sentiment from the set Tiny type from Clearly besotted stamps with versamark ink and then I embossed it with white embossingpowder. I cut a heart from red cardstock and added glossy accents on it. 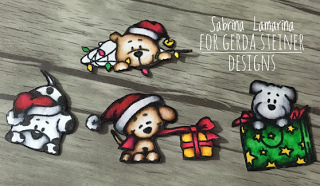 It's Sabrina here and I'm so thrilled for my first Guest Deisgn post for Gerda Steiner Desing!!! 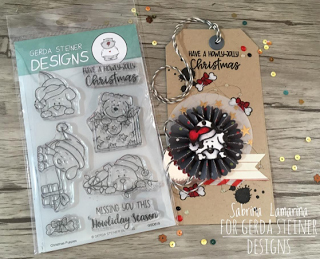 Today I am showing two project with "Christmas Puppy" stamps set. I love Coffee Monster stamp set by Gerda Steiner Designs and this is my tag using one of those super cute creatures. Hey stampers, it's me again, Anni, for another guest design post. I couldn't resist these super cute monster from the set Coffee Monster. 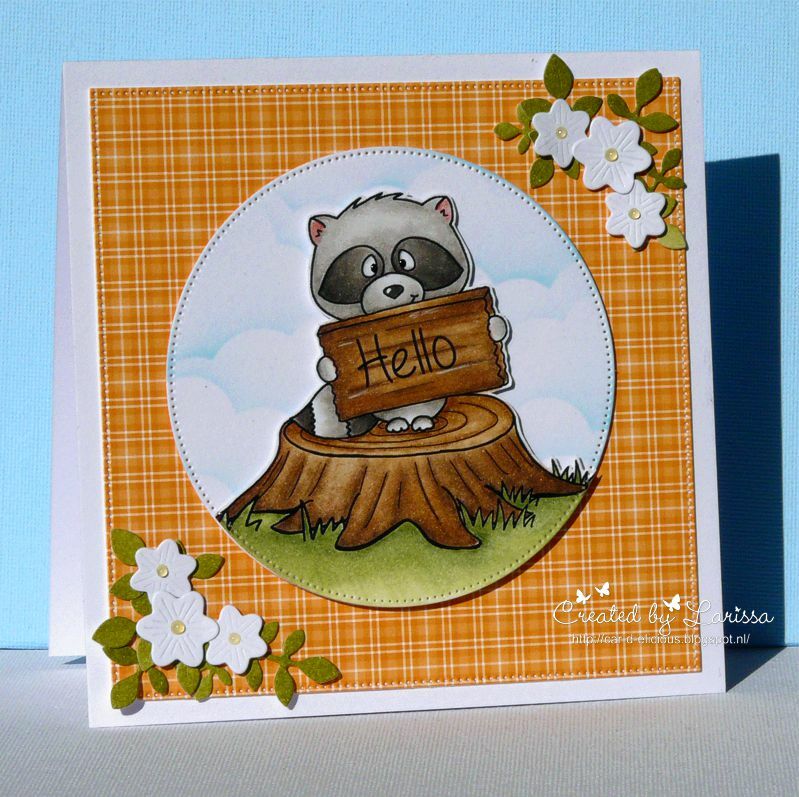 After my colourful monsters last week I decided to create a colourful background for this card. I started by masking of a stripe on a piece of water colour cardstock. I ink blended Distress Oxide inks in rainbow order. On this ink blended stripe I drew some circles with clear water. While the background was drying I stamped the monster in Copic friendly ink on white paper. 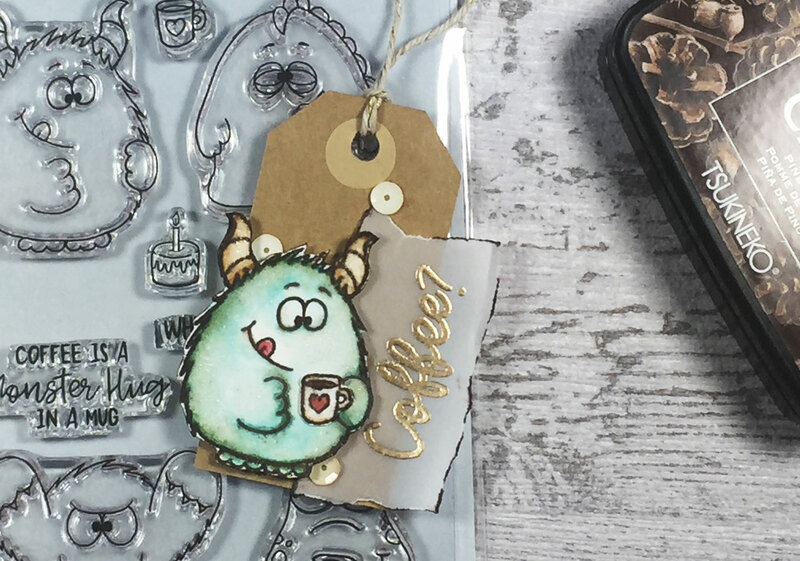 I coloured the monster in warm grey tones and added a little bit of silver glitter glue to it's dots. I fussy cut the image. I LOVE to fussy cut but if you don't, don't panic - there are coordinating dies available, too! I adhered a stripe of black cardstock to the background to make the colours even more and added some dots of Glossy Accents, too. Then I assembled the card! 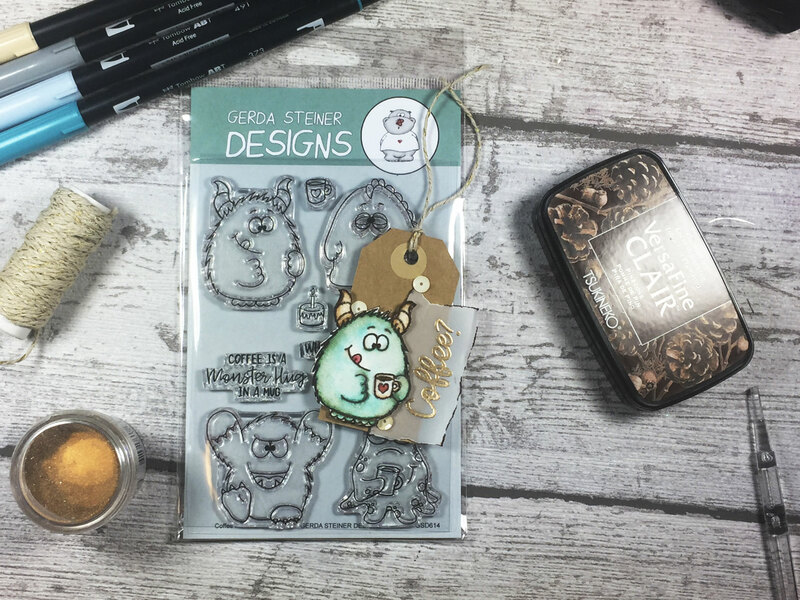 Thanks for stopping by and have a crafty weekend. Ich bin Anni aus Berlin, 40 Jahre alt und seit Februar 2008 nutze ich meine freie Zeit zum Stempeln - Entspannung pur! 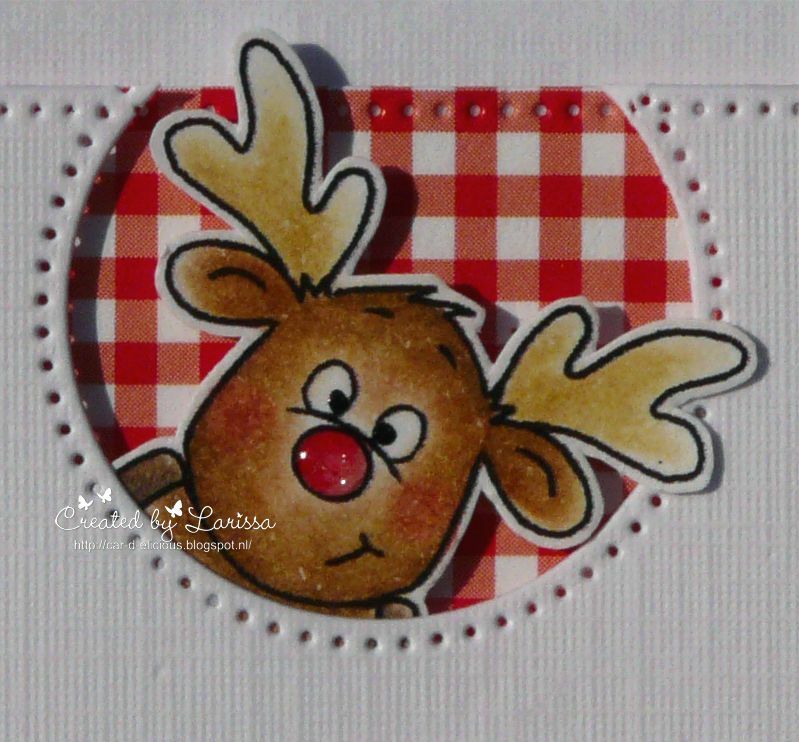 Hi everyone, I am Larissa from Car-d-elicious and today I am posting a christmas card with cute reindeer. 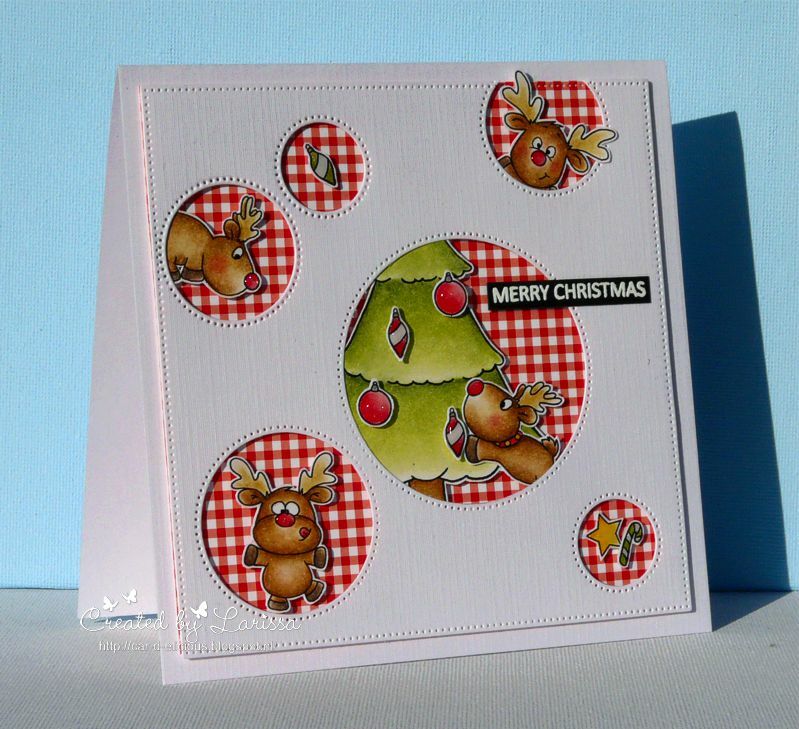 This time I made a christmas card with the stampset Reindeer and a tree from Gerda Steiner designs. I stamped a couple of images from the stamp set Reindeer and a tree from Gerda Steiner designs and then I coloured them all with my Polychromos pencils and the black glaze pen. Then I fussy cut all the images. With the Crea-nest-lies XXL 42 from Crealies I die-cut a square from white cardstock. I die-cut a square with the same size from red gingham design paper from the Tiny check brights paperpad from My favorite things. With the Crea-nest-lies XXL 49 from Crealies I die-cut a couple of circles in different sizes in the square from white cardstock. I adhered the white square with foamtape on the red gingham square and then I adhered them both on a white card. 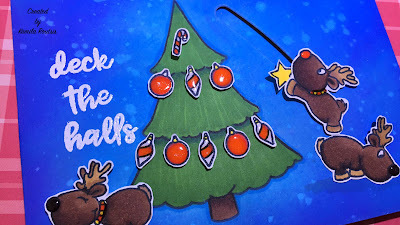 Then I placed all the reindeer, the tree and the christmasornament in all the circles. I had to cut parts from some of the animals away to make them fit in the circles....Sorry reindeer. 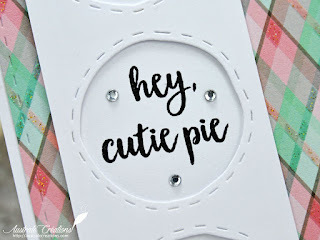 ;) I stamped a sentiment from the set Tiny type from Clearly besotted stamps on black cardstock with versamark ink and then I embossed it with white embossingpowder. 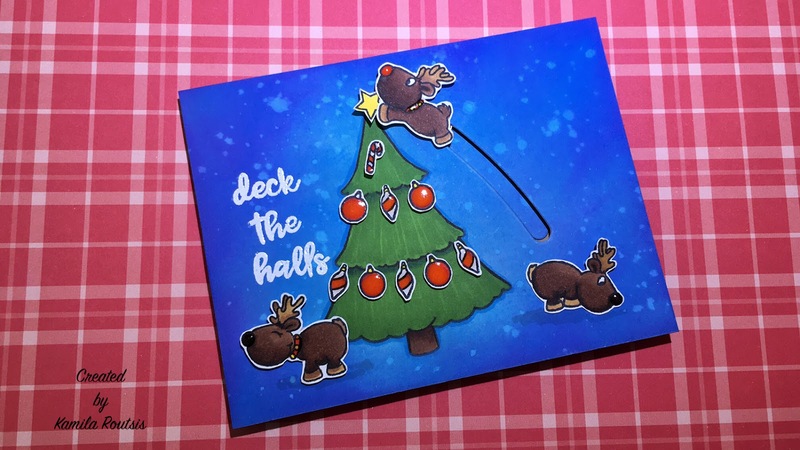 I coloured all the noses from the reindeer and the christmas ornaments with the Glitter gloss pen from Nuvo and then I applied glossy accents on them. I am so happy to be back as a guest designer this month. Coffee and monster? Hello? Couldn't get much cuter than that, could it? I couldn't decide which monster to use - so I used three of the four in the set. 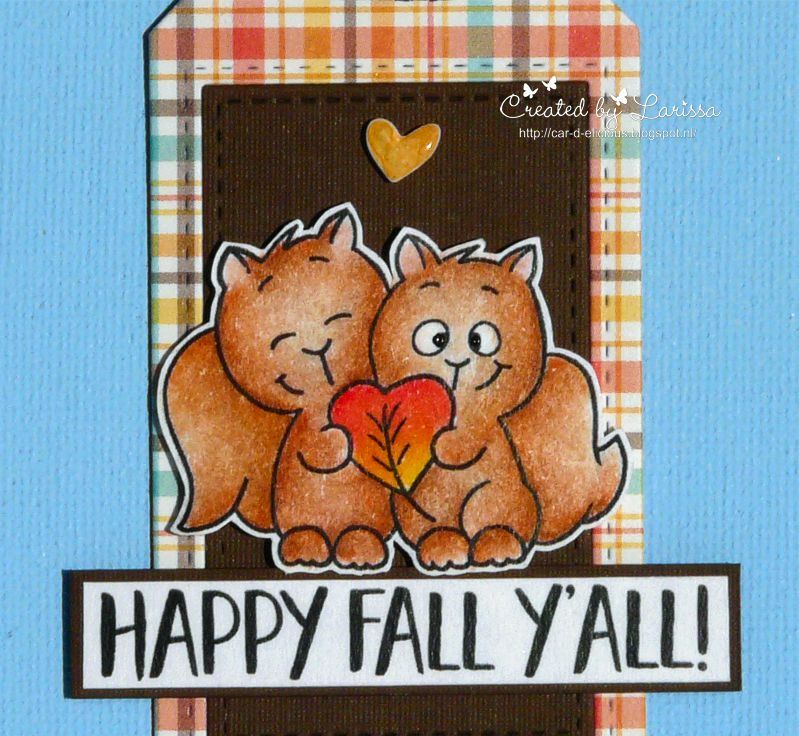 I just left the fourth out because there wasn't enough room on my card left - it is super cute, too! These two things are included in the set Coffee monster that I used for my card. I started by stamping the monsters with a black ink and coloured them with coloured pencils - my favourite colour medium. When you finish the colouring the black lines aren't really black anymore. Previously I went over the lines with a black pen. But I learned a great trick: If you leave the stamps in your stamping tool you can easily stamp them again after colouring - this time with a really black ink like Versafine! Fast, easy and a really good effect! Because of the cuteness of the monster I decided to keep the rest of the card simple. I die cut a stitched rectangle from white cardstock. I created a floor by ink blending a LITTLE bit of grey ink for the monsters to sit on. 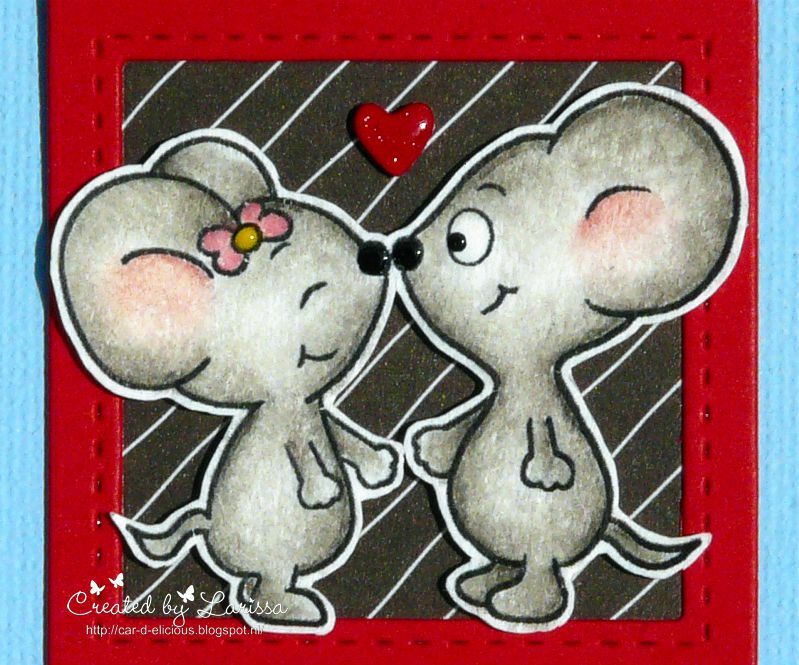 Then I stamped the sentiment and assembled the card! I just adore the bears in the More than Pie stamp set and they do make the prettiest cards. 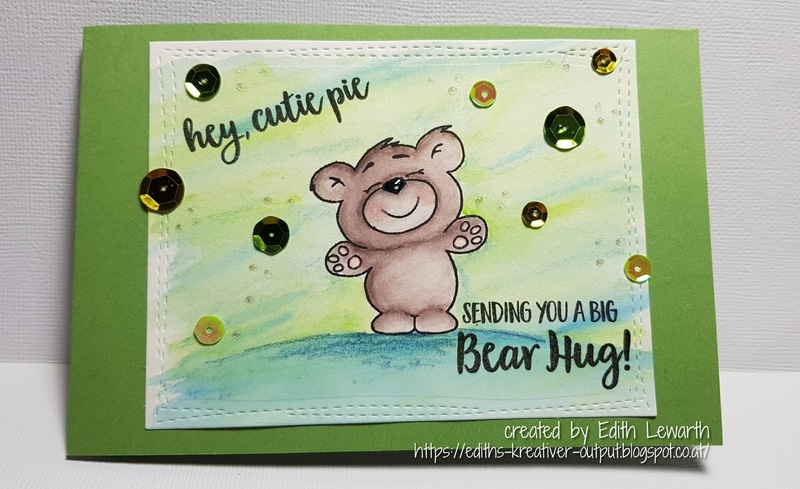 Bear, hugs, and pies are a great combo for a card for that special someone and what better way to show a friend that you care than with a bear hug. The pie is filled with fresh red berries so why not use the same color combo for a background. PLus the pink splatters kinda mimic the pie. Thanks so much having me as your guest, I have loved every second. 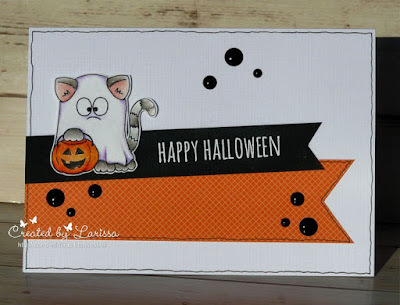 Hi everyone, I am Larissa from Car-d-elicious and today I am posting a halloween card with a cute cat on it. 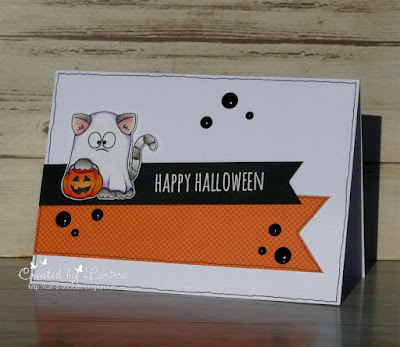 On my card I used an image from the set Where is the candy from Gerda Steiner designs. I have coloured the cat with my Polychromos pencils and a black glaze pen and then I fussy cut the image. From orange desigg paper from the Beachside petite paper pack from Lawn fawn (retired) I have cut a large banner. With a black pen I drew some lines on it. From black cardstock I cut a smaller banner. 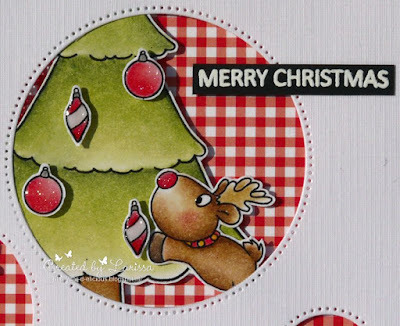 I stamped a sentiment from the stampset Crazy talk from Stampers anonymous on it with versamark ink and then I embossed it with white embossingpowder. I adhered the black banner a bit crooked on top of the orange banner and then I adhered the image with foamtape. On the white card I drew some more lines with the black pen. 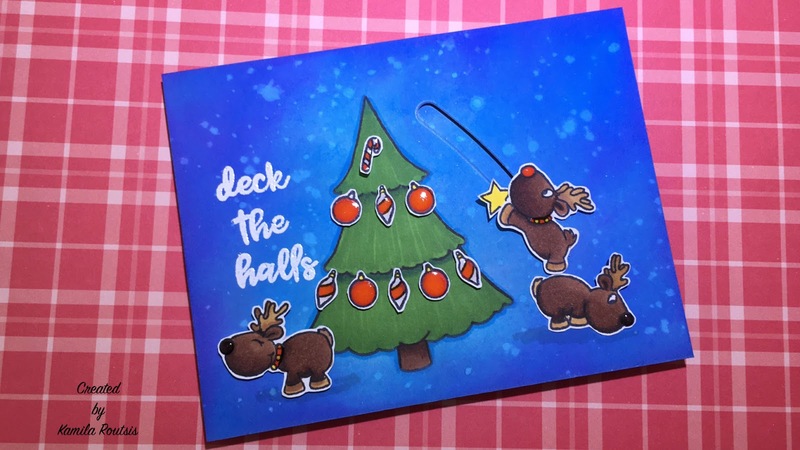 I decorated the card with black enamel dots. Labels: Halloween, Larissa, Polychromos Pencil, Where is the Candy? Reindeer and a Tree Peek a Boo! Hello everyone! 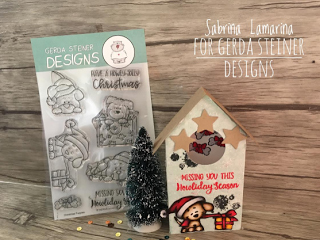 It's Mindy from Mindy Eggen Design and I'm back guest designing today for Gerda Steiner Designs using the Reindeer and a Tree stamp set. 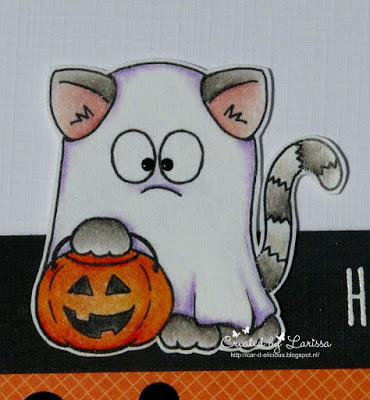 I also have a video for this card that you can view down below or on my youtube channel. I started out by creating my background for the peek a boo window using Faded Denim, Wilted Violet and Seedless Preserve Distress Oxides on Bristol Smooth cardstock. Then spritzed with water from my distress sprayer and soaked up with a paper towel. I cut out my peek a boo window using the Die Square Peek a Boo using Neenah white cardstock and my Big Shot machine. I also colored my image on Neenah White cardstock and colored in with my copic markers. Take a close look at one of my trees - its so shimmery!!! 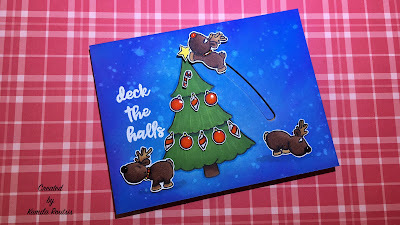 I used a glitter cardstock for that one - all supplies will be listed on my blog. 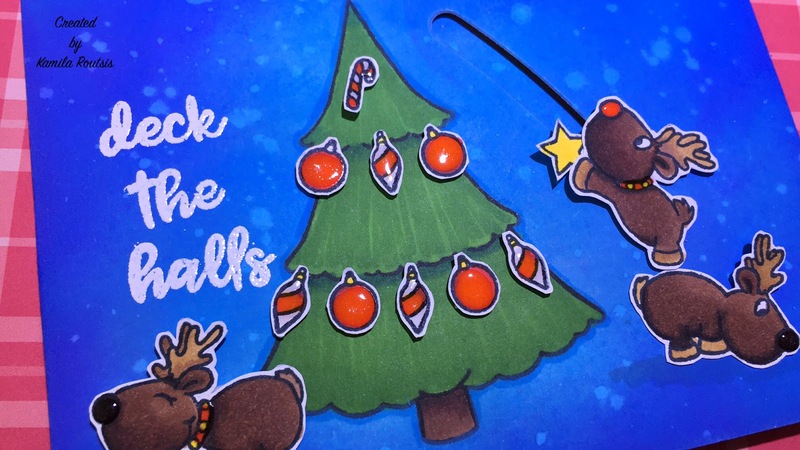 Then I put a little bit of adhesive in the corners to stick my trees and reindeer to. I added some foam tape to the entire back of my card to add some dimension and added the panel to a white cardstsock base. 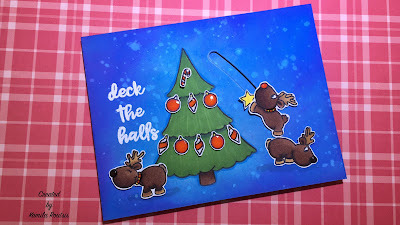 I finished it off with another reindeer grazing in front of the trees. I have a HUGE addiction..... anything that has to do with paper-crafting! Lucky for me I have a very supportive husband, a wonderful daughter (who loves paper crafts) and a little boy. This time I used my Inktense Pencils once again. For the backround I used the same pencils. 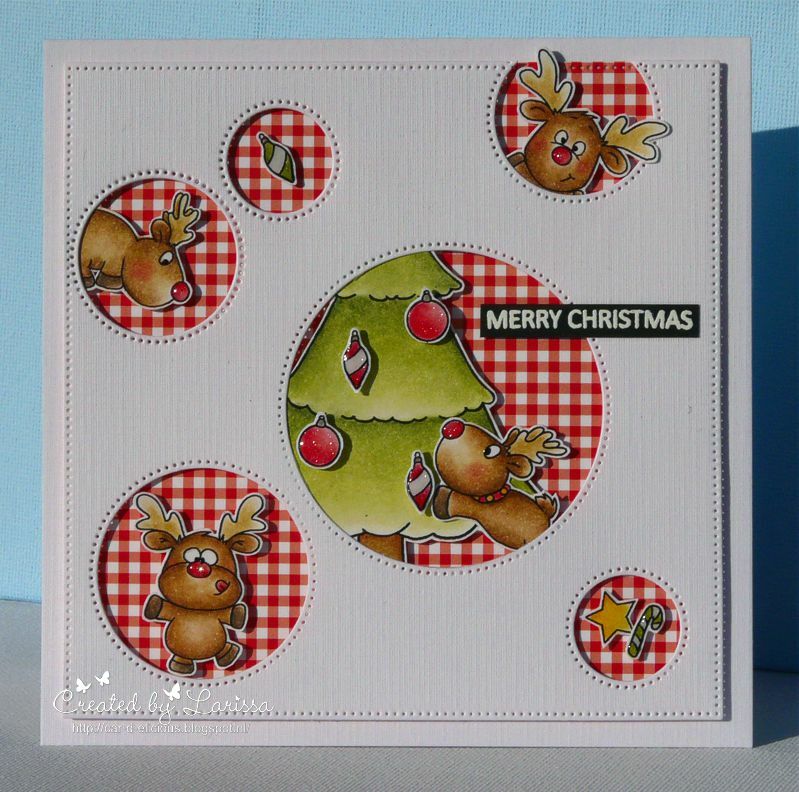 I diecut the motive with the Wonky Stiches Die, added some Sequins to it and - et voila - the card was finished. 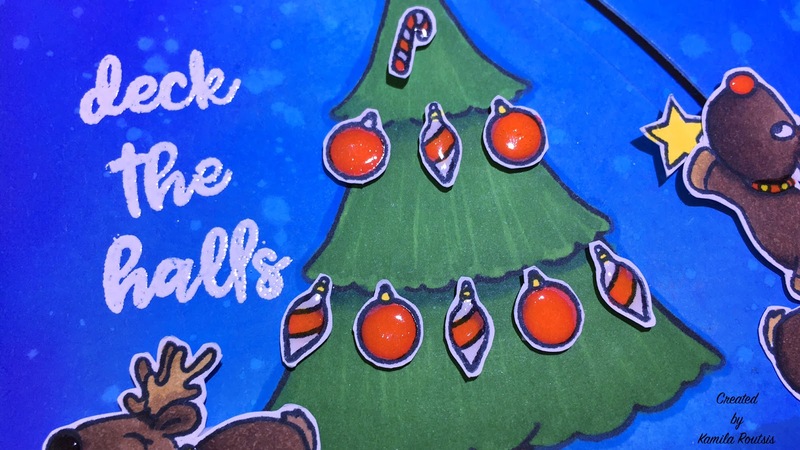 I hope, you like the card as much as I do! Kamila here, and today I have once again a pleasure to guest design for GSD. This time I have for you a fun slider card using the Reindeer and a Tree stamp set. 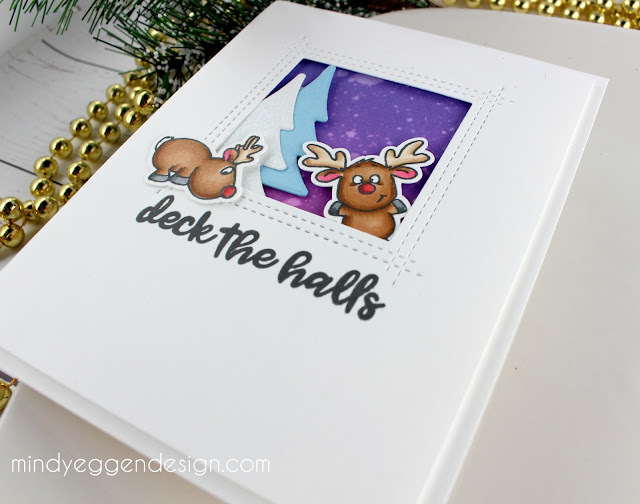 It was great using Oxide inks to create the background so fun and quick! I hope you will enjoy the video! It's Céline from Australe Créations, I'm back today for a quick and easy card made with the stamps set "More than Pie with Cute Bear and Pie". 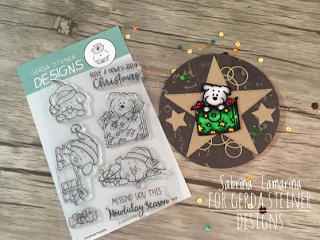 It's Anna Sigga here and I am thrilled to be guest designing for Gerda Steiner Designs this month. 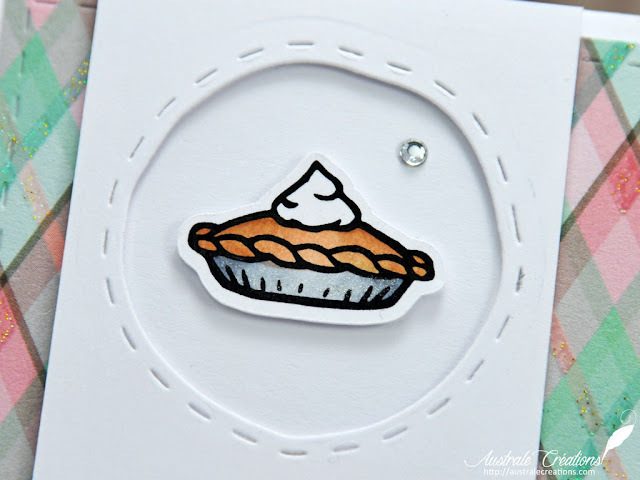 I do love a good pie so this stamp set is not only adorably cute but it kinda makes me hungry too. 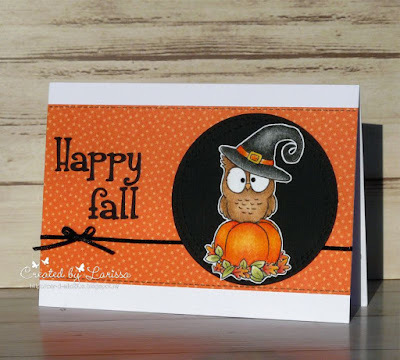 Hi everyone, I am Larissa from Car-d-elicious and today I am posting a fall card on the Gerda Steiner designs blog. This time I made a card with the stampset Where is the candy from Gerda Steiner designs. 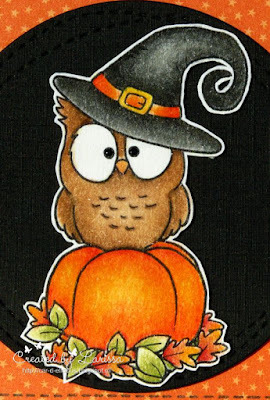 This time I used the owl image. I have coloured the owl with my Polychromos pencils and the black glaze pen and then I fussy cut the image. From black cardstock I have cut a circle with the Wonky stitched circle stax from My favorite things and I adhered the image on it with foamtape. On a white card I adhered orange starry design paper from the Beachside petite paper pack from Lawn fawn (retired) after I first tied black ribbon around it. With the Katie alphabet from Quickutz I die-cut a sentiment from black cardstock and I adhered it on the card. Labels: Fall card, Happy Fall, Larissa, owl, Polychromos Pencil, Where is the Candy?